Well, I had a fabulous few days away (I was working !) and had the chance to catch up with some old friends. 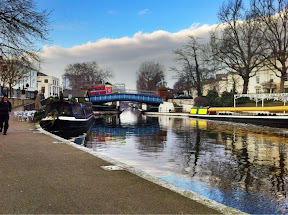 One thing I love about the new venue for the convention is its location, only a few minutes away from Hyde Park and right on the Paddington Basin and the start of the Grand Union Canal. One thing running has done is give me a good excuse to go out to places that I might not visit otherwise. Before I started running I didn't really leave the convention hotel for 5 days apart from the evening out to pub or restaurant. Since I've been running I have been out and seen more of the area. 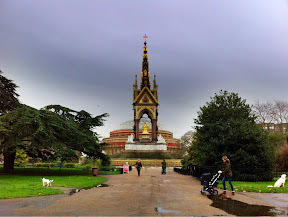 One run I wanted to do was round Hyde Park. I have never been round Hyde Park before.... I mapped out my route down Edgeware Road, round the edge of Hyde Park and back, a total of just over 5 miles so it fitted in perfectly with my marathon training plan. This may sound strange to anyone that lives in London but it was quite strange seeing so many people out and about in the park. When I'm running over the Downs if I see 6 people it is busy and quite often I don't see another person for most of the run ! This (I think !) is the back of the Albert Hall.